Kate’s Prime Rule: Unpack and repack once per country. 1. Go to www.airbnb.com and look under Dublin. Find a nice B&B. Somehow get to Dublin. 2. Go to your Dublin B&B. Unpack and sleep then go downtown and hop on a bus. Take the scenic two-hour trip. Knock back some lamb stew and a Guinness at The Bankers pub. 12 Euros and enough food for two people to share. The next day take the bus again and jump off at the places that seemed fun. (The second ride on the bus is free and you know what you want to see.) Book online, a bit more economical. Here’s a short clip from the top of our double-decker bus. The driver/narrator talks about Oscar Wilde. The three best bus stops are the jail (Kilmainham Gaol), Guinness Storehouse and Trinity College. 3. Eat pub food. (There are 1,000 pubs and 500 churches in Dublin.) You can drink twice as fast as you can pray. From Dublin you can take the Dart all over the place. Two adults and four kids can ride anywhere in and around the city for 10 Euros a day. Kate and I went for a week but stayed for two. Cost, after getting there, was about 75 Euros a day. That’s for both of us. Following are notes we wrote to Anne and her husband, John, who run a terrific B&B overlooking the Irish Sea: The first note is mine. When we arrived in Dublin at the Heuston railway station, following a fun and friendly train ride across Ireland (after a transatlantic flight from Los Angeles to Shannon), there was a beaming Anne to pick up my exhausted wife and confused me. Look there’s Trinity College that the production designers of the Harry Potter films borrowed from…past historic images that had inspired James Joyce, Oscar Wilde and Jonathan Swift, and the home of The Book of Kells, well over a thousand years old…. 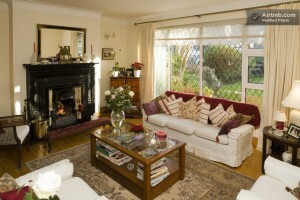 And, soon we were sitting in the living room of Anne and John’s home ─ a few blocks from the Irish Sea. One delight heaped on the next. Our private bedroom with beds that could have seduced Sleeping Beauty into slumber better than any tainted spinning wheel. Sheets crafted from the finest Irish embroidered linen. A private bathroom featuring brass fixtures, a tub and walk-in shower and a porcelain sink you could bathe triplets in. Warm fluffy towels worthy of any five star hotel. Not a spot of dust. We were prepared for the house because we had seen pictures of it on Airbnb. Nothing could have prepared us for Anne and John. Well, of course they can’t be leprechauns. Too large. Never have I seen two people who knocked themselves out more to make our visit to their home so enjoyable. From the tea and coffee (and yes, a welcoming shot of fine Irish whiskey) upon our arrival to the most luscious and complete Full Irish Breakfasts since Dublin became a city in 900 AD. How to describe one of Anne’s morning creations? Anne made no big deal of it and gave us complete run of her kitchen any time we wanted. 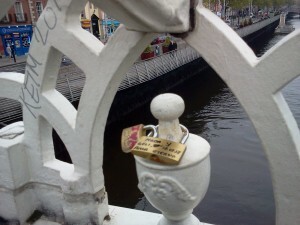 John and Anne have been Dubliners all of their lives and love their city. They both went to Dublin schools, fell in love and married. Raised three great kids who have moved out. Empty nesters. John loves all sports. Anne loves interior design, reading and travel. Best for all weary travelers, they love having guests. Even going so far as to drive them to train and bus stations and historic spots only the locals know about. Maybe I was wrong. Maybe they are leprechauns. The large size with the enormous hearts. Anne Drumgoole is an Irish angel. She picked us up upon arrival after a long flight from LA and took us to her lovely home on the Howth Peninsula where she fed us a lovely Irish breakfast. After we had unpacked and rested she showed us around Howth. On Saturday morning she took us to a local farmers market where she buys fresh flowers and produce. She filled every room with beautiful fresh flowers. She and her charming husband John drove us to the local Dart/train station when we wanted to go into Dublin and they offered to pick us up if we were too weary to walk the mile back to their house. She even drove me to the airport to straighten out something that was wrong with my ticket after several failed attempts to resolve it by phone (and of course we took the scenic route). She lent me a wristwatch when she found out that I had forgotten to bring mine. With a cell phone and computer my watch has been put away; but since I hadn’t converted my cell phone over to European use I wasn’t sure what time it was. When I couldn’t find leg of lamb on the menu she cooked us the moistest, most delicious spring lamb dinner I have ever had which we enjoyed in their beautiful garden. On a day trip I had a bit of an accident and fell on my face in some loose gravel (my pride and vanity were more hurt than my body). To sum it up: It was like a home away from home, but better. On the last day, pack up. Leave the silverware and take the memories. 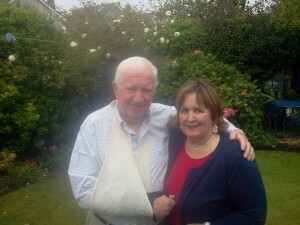 Here’s a photo of Anne and John in their garden where they served us Irish lamb. And, despite a broken wrist, John drove us all over the place.